When you make a film it can be a deeply personal and important event for you. When I made my short film ‘Lilly’ I put a whole stack of myself into it and I found the process of making it to be one of the most rewarding things I’ve ever done. I am very happy with ‘Lilly’ – I feel like we basically made the film that I wanted to and it’s one of the few things I’ve produced that I feel almost comfortable showing to other people. It’s still an anxiety inducing event to watch it in a room full of people though. I’ve still got a long way to go to get to the level that I’d like to be at. So, if you can get over the initial fear of actually allowing people to watch your movie soon comes the time to send it out into the world. For a filmmaker at my level I really had two options open to me: I could put the film online, promote it and hope to find an audience or I could send it to film festivals and hope it gets accepted and develops a buzz from there. There are, obviously, pros and cons to each approach that I’m not going to explore in an in-depth way because, frankly, there are people far more qualified than I to do that. What I will do, however, is briefly touch on some of the elements that were most pertinent in my decision and what’s happened since. Despite Lilly being a short film the final cut came in at 28 minutes. That’s not an ideal starting point for either online or festival promotion. Many film festivals prefer their short films to be at the very least under 25 minutes if not shorter, and everyone knows that you’ll struggle to hold or even draw in an online viewer for something over three minutes. I could have made cuts to the film to get it down to a more manageable length, and in retrospect perhaps I should have, but this was my first film and I didn’t want to lose any of the moments or space in the film because I’d landed squarely on my original vision for the piece. Utlimtately I decided that I wanted to send Lilly to film festivals and see whether or nt we got a positive reaction. I suspect there was something in me that liked the idea of my film being shown on the same screen as some other more credible films. Because I also work a full time job I didn’t have the free time to research the multitude of festivals that are out there and then go through the long process of submitting. To overcome that problem I decided to hire in an external company to handle the process. I ultimately went with Festival Formula, a company run by the lovely and knowledgeable Katie McCullough. She produced for me a list of festivals that might appreciate what Lilly was trying to say and handled the whole submission process for me. I can’t recommend this company or Katie enough. Any shortcomings that Lilly had in gaining entry into festivals are totally down to the film and my own decisions. The Advice Katie offered throughout was impeccable and perhaps something I should have taken on board in a bigger way - especially regarding the length of the film! This was always going to be a costly experience and after submitting to about 25 festivals I’d totally exhausted my finances, so, I sat back and waited for the responses to come rolling in. Then I waited some more – and some more. Then it happened! The first response. I very quickly became accustomed to this sort of response. Whilst I thought I had prepared myself for the inevitable rejections I don’t think I realised just how disheartening it would be to see your film rejected from all the festivals you were so desperate to get into. Like I said, this film was a bit part of me and it can be hard to separate the rejection of your work from being a rejection of yourself personally. But then, in rode the East End Film Festival to save the day! 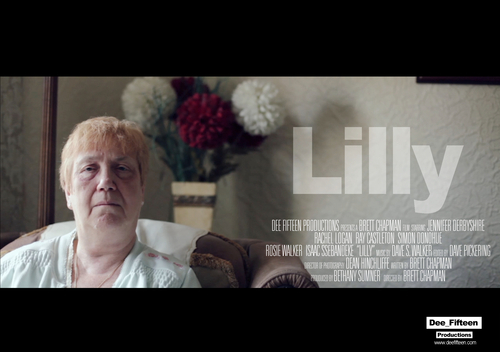 The first festival acceptance for Lilly took me to London to watch Lilly being screened as part of The East End Film Festival’s ‘Britain on Film’ programme. It was wonderful to see my film screened alongside some really wonderful shorts and the short Q&A post screening was a fun, if nerve wracking, experience. I will forever adore The East End Film Festival for accepting my film. I had hoped that the EEFF screening might have been the start of a few screenings for Lilly but unfortunately that’s not the way it went. A combo of rejections came a few weeks later and its been much the same ever since. I’ve seen other films that I worked on finding their way into some pretty prestigious festivals and that is heartening and I’m pleased for the filmmakers involved but it does kind ofcement in place the disappointment that my own work hasn’t found an audience. I think it’s important to remind yourself that this is something most people who pursue creative endeavours have to go through. Not everyone is going to ‘get’ what you’re trying to say and, furthermore, there’s no guarantee that what you create will every time be ‘good’. It’s a long process. So, rather than get down on the fact that Lilly hasn’t found its place on the festival scene I’ve been trying to come up with the next move for the film and that took me back to my original two choices: online or festivals. I’m not too proud to see that, for whatever reason, Lilly isn’t doing it on the festival circuit so to plow more money that I don’t have into more submissions that likely won’t be accepted doesn’t make sense to me. More and more I’ve been thinking about making the film available to view online. More than getting good reviews or seeing my film on a big screen I think the thing that is most important to me is that its viewed by people who understand what it’s trying to say and appreciate the themes that I’ve tried to flavour it with. The most encouraging thing that’s happened during Lilly’s short time out in the world is the response I’ve had from the audiences who have watched it. Quite a few people who watched the film took the time to tell me that the titular character really reminded them of strong women in their lives and thanked me for making the film. That felt amazing. One person saying something like that to me was enough justification for making the film in the first place. Some people even cried. I had joked when making the film that all I wanted was to make someone cry with it. I guess that sounds sort of crass but all of the films I most admire make me cry. Here I am, then, weighing up when and how exactly I put my film online. I could upload it to Vimeo or YouTube and try to promote it via social media and short film websites or I could look into VOD options. To be honest, I don’t think Lilly has the audience interest to do well on VOD. So, at the moment, I’m planning to put the film online, for free. It’s OK to be rejected. It is not the end of the world and I don’t think it’s the end of the journey for your film, if you believe in it. All I really want is for people to have the option to see the film if they choose to. I say it all the time but I don’t think a film exists until it has an audience. With that in mind, watch this space for updates about where Lilly will be available to view and if you’d like to help promote the flick, that’d be lovely.